Most offline marketers are struggling to land clients by cold calling, expensive direct mail, and time consuming face-to-face selling. Us? We used to spin our wheels like that, but now we use our Private Email System to turn cold prospects into Hot Paying clients like clockwork. We’re full-time offline consultants in Maui Hawaii. Every week we provide marketing services to local businesses and they pay us handsomely. That allows us both to live pretty sweet lives here in paradise. But before you get jealous, let me share a secret with you. When we first started we struggled getting clients. We HATED cold calling and lived in fear of doing it. We didn’t have money to run expensive direct mail campaigns. Face-to-face door knocking selling was time consuming and extremely frustrating. So we turned to the only option left. Cold email. We followed the so-called gurus advice and used software to scrape email addresses and send out hyped-up emails pitching our services. We asked other local marketers what success they’ve had with cold email and to our surprise most of them were in the same boat as us. The GURU’s Won’t Tell You. 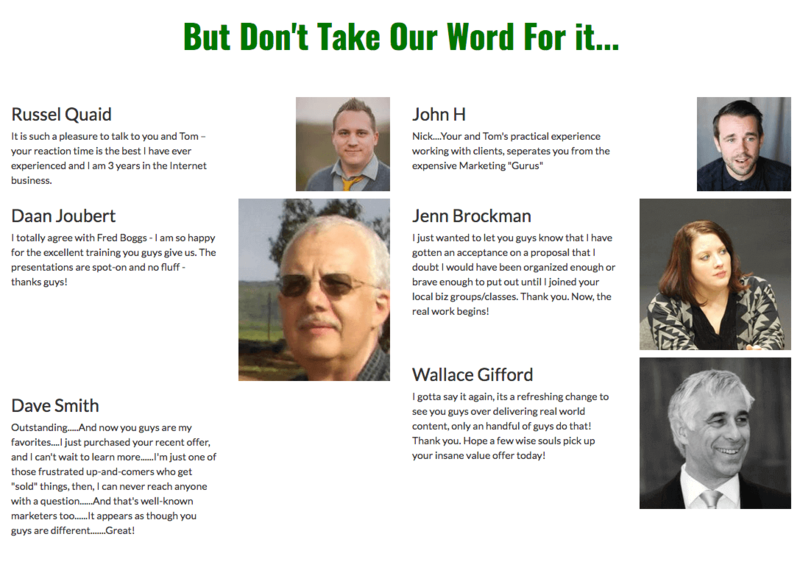 Connecting through cold email the way 95% of offline marketers do, doesn’t work, it Backfires! Use software to scrape email address and send out hundreds to thousands of emails. Pack their emails with hard sell copy. 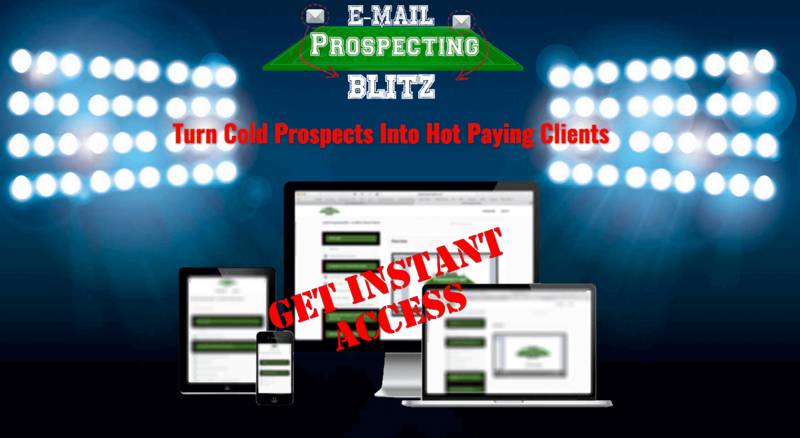 Prospects are busy… Their inboxes are crowded… They get hammered by hundreds of other marketers trying to sell them through cold emails every day. The sad truth is, the more you spam their email, the more they HATE you. Sorry, but thats’ the truth. if you do what everyone else is doing…you’re guaranteed to fail. Swear on a bible, a nine year old child can do this, and heres proof. 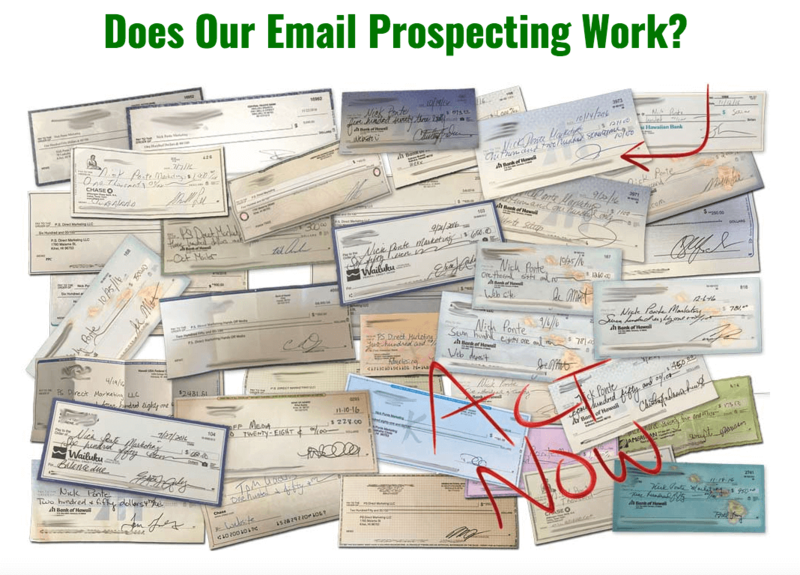 We dug into EVERY nook and cranny of Cold Email Prospecting. WE continue to fine tune and test RIGHT UP TO THIS LAUNCH, so nothing is outdated! And Got 500% More Clients with Almost NO Hassles! 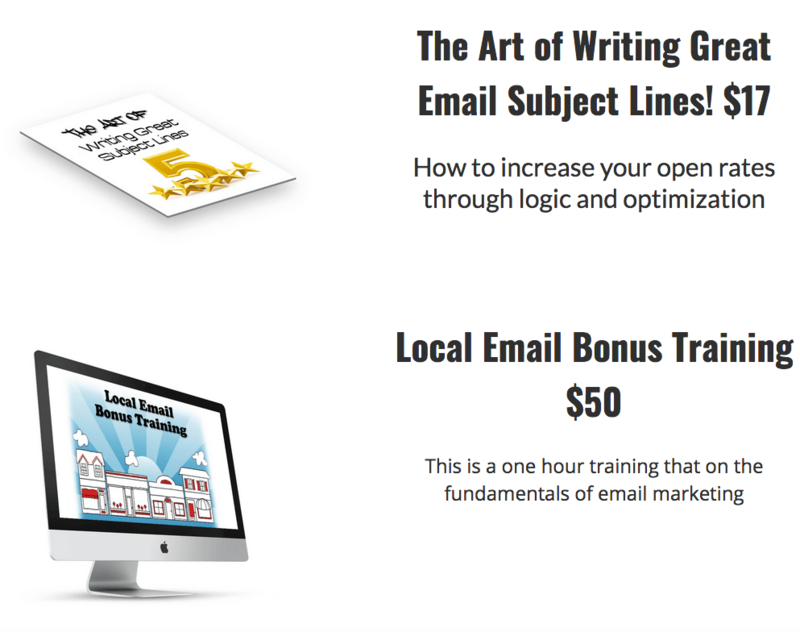 We developed a formula to write emails that got RESULTS…opens, calls and appointments. AND we use our ‘Secret Sauce’ to turbo charge this system 500% More. Imagine The POWER you’ll Have when you can literally land clients at will…WITHOUT spending any money.Imagine the respect you’ll get from family and friends once they see with their own eyes how your client base grows. Isn’t building a list expensive? No not at all. Especially when you see the way we build our prospecting email lists. This process can often be free or very low cost. Will I be breaking any spam laws? Not if you follow our simple instruction. We have NEVER had an email accout closed or been warned. Can My email account be closed?Highly, highly unlikely, but even it was, its simple to open another one, even at the same email provider. Does This Take A Lot of time? Thats what so surprising. Once you use our “Quick SetUp Technique”, this takes almost no time to manage. Do Prospect clients open emails anymore? Absolutely! Even though people claim they don’t open emails, all the research says they do…businesses too. Not likely. The uniqueness of this method and customization make it largely unaffected by competitors. We think so, and so do the testers we gave it to. In email marketing its the LITTLE things that make the BIG difference. Yes, many are the same ones we use currently. And we’ll have new ones down the road. We’ve only had a few early testers but so far all have gotten positive feedback, including replies, calls and appointments. 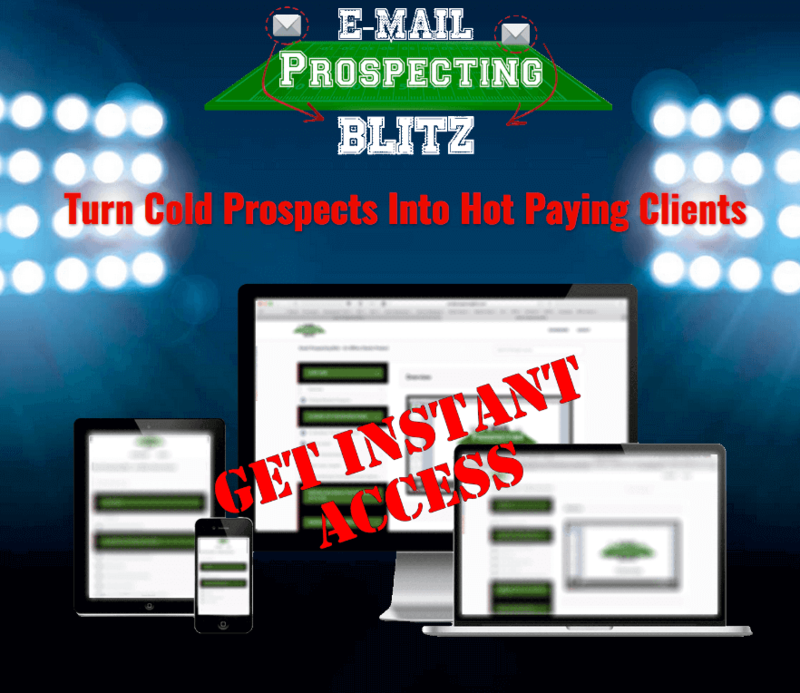 You get instant lifetime access to Email Prospecting Blitz. 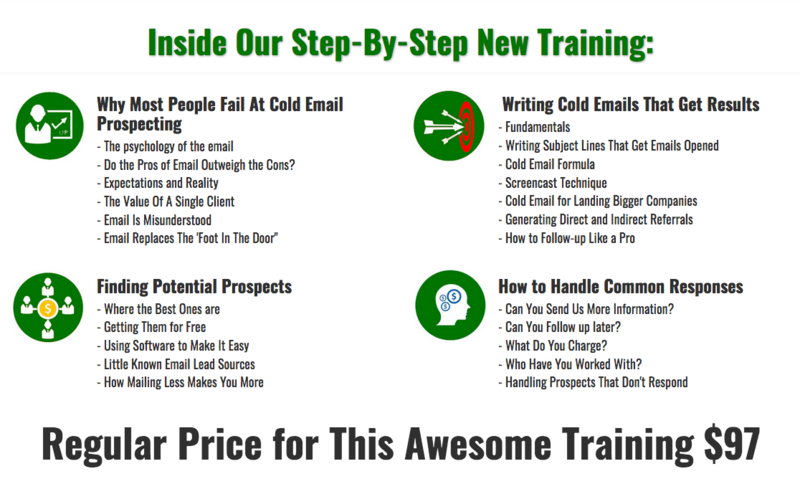 With this training you’ll bypass all the newbie mistakes and wasted dollars. We’re giving you a proven system that delivers.